Earlier this summer I signed up for the 'Creative Chaos' Challenge hosted by Sandra McGriff AKA Skye. By signing up I agreed to take on the task of making something out of the items I was sent. There were four bags and you must use something from each bag. 4. 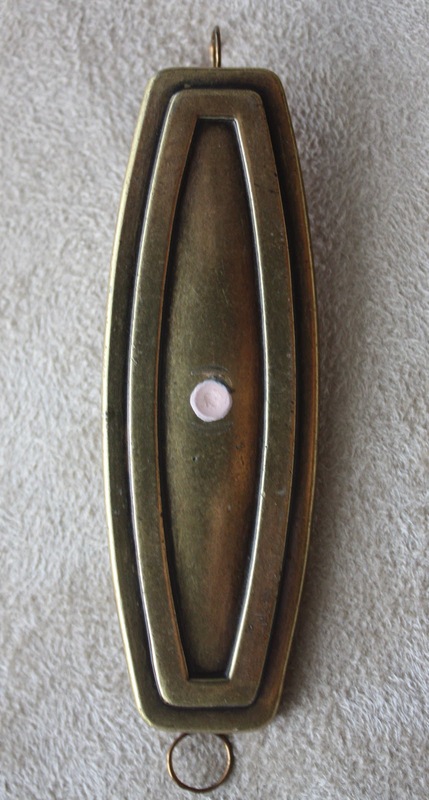 Leather button, die, vintage ivory colored buttons. Bag 1- I knew the feathers were not going to work for me. Bag 2- I was initially drawn to the fuzzy yarn, but it was too short. I ended up 'dyeing' the polyester cord with alcohol inks to achieve an aged look. Bag 4- The leather button fell right into place as my theme developed. I used Mod Podge to adhere some scrapbook paper decorated with handwriting script to the hardware focal. I used E6000 to attach the shells and glass to the focal near the bottom. Wired and attached the dangle shells and wood. 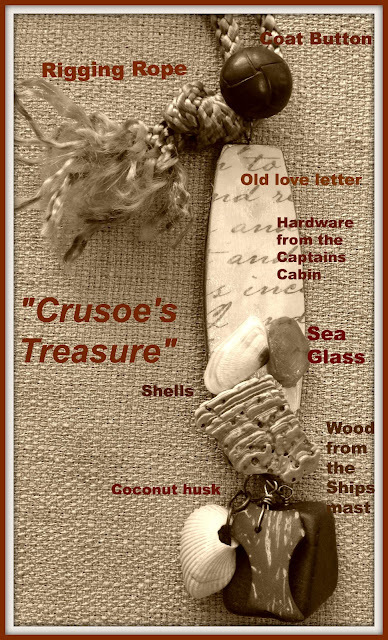 Strung the cord through my connector and ...VOLIA' ~ "Crusoe's Treasure"
I would like to Thank Sandra for an interesting challenge. I certainly stepped outside the box and into some Creative Chaos! I appreciate you stopping by. I welcome you as a friend & would greatly appreciate it if you would consider becoming a blog follower too. This is a blog hop ~ Please stop by the other blog participants listed below and see what they created from the same components. Wow - way to go! I am totally impressed with the piece you came up with! Brilliant to go with Robinson Crusoe!! I'm just blown away by the jewelry creations in this blog hop! 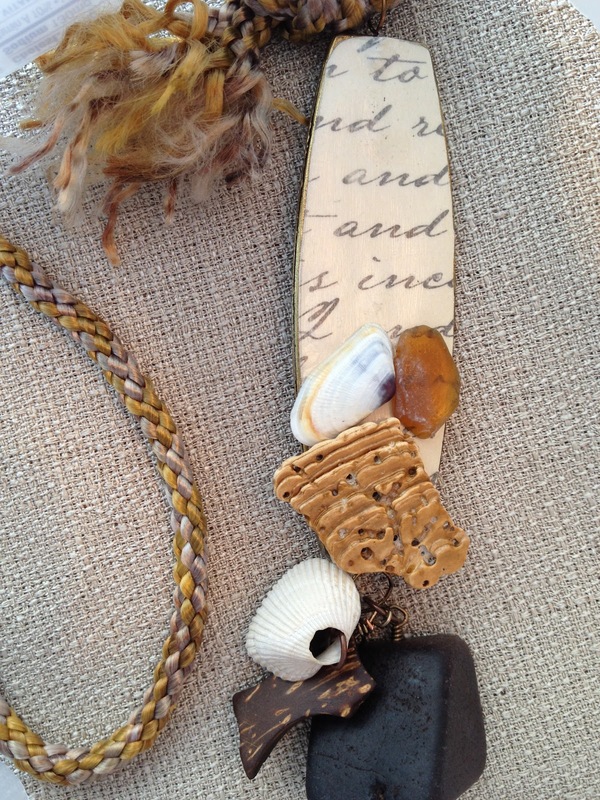 Love the materials - shell, love letter, wood, sea glass... cool and beautiful ocean jewelry! Well done! I love that you made one piece from all 4 bags. Beautiful! Wow Tammie. I LOVE it...resourceful and beautiful too! Really nice! They don't even look like the pieces I got anymore. I'm so very impressed!! This is the first time I've heard of this hop and I'm definitely intrigued! Your creation from those ingredients is pretty stinkin' awesome. I love the way you altered that hardware piece. Very cool! What a beautiful piece! I love how you altered the brass piece, and used pieces from all 4 bags!